Current and planned satellite systems for fixed and mobile use now demand an array of advanced communication payload design/analysis techniques and architecture strategies. Developed for communications engineers, satellite designers, and systems architects, this popular course provides a practical understanding of how modern satellite payloads (repeater and antennas) are designed and assembled into end-to-end systems to meet the most demanding service requirements of the private and government sectors. Explore design objectives and principles for both analog “bent-pipe” and digital on-board processing repeaters as well as the overall system regarding its architecture, conceptual design, and ground segment engineering. With a focus on digital narrowband and broadband applications, the course considers operations in all of the current frequency allocations: UHF, L, S, C, X, Ku, Ka and optical bands. The lectures are broken down into major areas of investigation that allow participants to focus on elements of a communications satellite payload, satellite constellation, and ground segment, and how they combine into the overall system. Operating environments include broadcast and interactive 2-way services, as well as communication systems that support earth observation and space science. 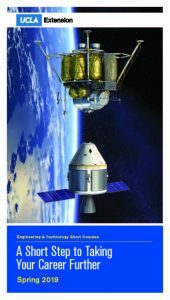 The course begins from a systems engineering standpoint by identifying the requirements for the satellite payload, constellation, and end-to-end system using current applications in digital video and broadband media, the Internet protocols and services, and mobile services to land, sea, and airborne platforms in support of space research and exploration. Requirements of the satellite payload are derived and specifications reviewed at the input/output and subsystem level. The course assesses the performance of all major building blocks (the repeater and its components, the antenna system, and tracking capability). Review design principles and performance budgets for each element, such as receivers, multiplexers, power amplifiers, analog and digital processors, reflector and feeds, and phased-array antennas. Instruction covers critical analysis concepts, such as loss budgeting, group delay, intermodulation distortion, digital impairments, cross-polarization, adjacent satellite, and adjacent channel interference for subsystem and system design. Students also learn strategies to compile requirements and pursue the spectrum/orbit resource needed for success. In addition to a thorough review of the satellite payload design process, students explore the ground segment and overall system, including requirements for major earth stations such as gateways and ground operations facilities and user terminals to deliver 1-way receive services, such as digital Direct-to-Home (DTH) TV, and 2-way interactive services using VSAT and mobile communications technologies. Instruction presents design tools for link budgets and end-to-end performance assessment. The course concludes by considering a practical methodology for evaluating and optimizing the performance of the overall system. Instruction emphasizes design principles using classical mathematical techniques, along with modern software tools for personal computers. The course includes extensive examples and participants are encouraged to bring along their particular design problems for consideration in class. Participants receive the text Introduction to Satellite Communication, 3rd Edition, B.R. Elbert (Artech House, 2008) and lecture notes on the first day of the course. These notes are for participants only and are not for sale or unauthorized distribution. Bruce R. Elbert, MSEE, MBA, President, Application Technology Strategy, L.L.C., Georgetown, Texas; and Adjunct Professor (ret. ), College of Engineering, University of Wisconsin, Madison. Mr. Elbert is a recognized satellite expert and has been involved in the satellite and telecommunications industries for over 40 years. He assists major private and public sector organizations that develop and operate cutting-edge networks using satellite technologies and services. During 25 years with Hughes Electronics (now associated with Boeing Satellite and Intelsat), he directed the design of several major satellite projects, including Palapa A, Indonesia’s original satellite system; the Galaxy follow-on TV distribution system (the largest and most successful satellite TV system in the world); and the development of the first GEO mobile satellite system capable of serving handheld user terminals. He has written 7 books on telecommunications and IT, including The Satellite Communication Applications Handbook, 2nd Edition (Artech House, 2004); The Satellite Communication Ground Segment and Earth Station Handbook (Artech House, 2001); and the course text. Satellite architectures, generic capabilities of GEO and non-GEO satellites, service requirements for Bent-Pipe Satellites, digital TV (direct-to-home satellite broadcasting and DVB systems), telephony (single-channel and multichannel services), data/VSAT Networks (star and mesh networks), basic operation of the Internet Protocol over satellite links, mobile services (CDMA and TDMA), digital audio broadcast via satellite (XM Satellite Radio and Sirius Satellite Radio), and service requirements for digital processing satellites. Characteristics of the space-ground RF link; the appropriate use of link budgets; network design methodology; analytical system analysis approaches; collecting and quantifying traffic requirements; basic interference analysis (antenna sidelobes, carrier to interference ratio, and orbit spacing); and performing space segment versus ground segment trades. RF system analysis for the satellite payload; top-level payload specifications (EIRP, SFD, and G/T); overview of transmission system in terms of power and gain; digital impairments (Bit Error Rate [BER], Eb/No, implementation margin); modeling repeaters; antenna concepts; co-polarized directivity and gain; cross-polarization; and estimating antenna gain (basic antenna formulae and gain-area product). Transponder design requirements; frequency translation; low-noise amplification; transponder frequency plan and channelization; power amplification (linear and limiter/AGC mode operation); bent-pipe payload architectures; LNAs/downconverters/receivers; input filters and multiplexers; passive microwave hardware (waveguide components, circulators, directional couplers, and hybrid dividers); beam and channel switching; pre-amplification and linearization; high-efficiency power amplifiers (TWTA and SSPA); and output filters and multiplexers. Fixed reflector antennas; feeds and feed systems, movable and reconfigurable antennas; shaped reflectors; circular and linear polarization antenna design; dynamic beam forming; detailed antenna characteristics (polarization purity, surface tolerance, and isolation); and antenna measurements. Gain/loss budgets; Saturation Flux Density (SFD); system noise and its effect on G/T; EIRP optimization; repeater frequency stability and phase noise; spacecraft pointing; budgeting for channel characteristics and impacts to baseband signals; gain flatness (amplitude ripple); group delay and its impairment to digital services; phase shift vs. frequency; out-of-band rejection (adjacent channel and external); amplitude linearity (C/3IM and NPR); and passive intermodulation (PIM) and multipaction. A/D and D/A conversion, digital signal processing for typical channels and formats, demodulation-remodulation processing, multiplexing and packet switching, static and dynamic beam forming, design requirements, and service impacts. Multi-horn reflector antenna systems, elemental phased array systems, reflector-based phased array, direct radiating arrays, lens antennas, analysis of beam-to-beam isolation, computer analysis, and subsystem testing. Review of domestic and international regulatory processes and procedures (FCC and ITU); choosing frequency bands that best address service needs; and development of regulatory and frequency coordination strategy. Overall architecture of the ground segment: centralized versus distributed networks; classification of ground stations; transponder utilization principles; providing adequate uplink and downlink margin; selection of the appropriate antenna size; and earth station internal tradeoffs (RF power and EIRP, receiver noise, and G/T). Receive gain and transmit EIRP budgeting; estimating antenna, receiver, and system noise temperature; low-noise amplification (LNA versus LNB); G/T budgeting; and selection of microwave components. Developing the top-level specification; RF specifications; baseband specifications; detailed block diagram; antenna systems (center-fed and offset parabolic, Cassegrain, tracking systems); and transmitter systems (KPA, TWTA, SSPA, and redundancy switching). User terminal technology: antenna and SSPA, modem, multiplexing, compression/decompression; interface to external devices: TV, telephone, PC, and terrestrial networks; considerations for consumer design; transportable and fly-away terminals; airborne and shipboard designs; and personal and handheld user terminal concepts. Performance comparison of multiple access systems: FDMA, TDMA, and CDMA; analytical models of network performance; satellite capacity sizing and footprint evaluation; transponder capacity planning; and lessons learned in a real project. Adapting the TCP/IP to the GEO satellite path; acceleration and spoofing to reduce end-to-end latency; support for emerging Internet applications—video conferencing (H.323); voice-over IP (VoIP); content distribution and caching; and verifying performance in conjunction with Internet services and applications. Collect and refine the requirements; survey of available technology and resources; incorporate the spectrum plan and alternatives; perform tradeoffs to resolve design issues and develop the most appropriate set of specifications; oversee design and integration of space and ground elements; and verify end-to-end performance at each stage through delivery, resources and documents to aid in the process. System to be selected based on current developments in the industry; review of each major element, relating it to the design principles of the course; review of spectrum/regulatory strategy and results; and discussion of objectives versus lessons learned from the project.